My dad has a craftsman like this, and he showed me the wheels when i was there last summer, one of them was bent badly outward from the top, unfortunately the design of the front bar thing across the front between the wheels is just folded metal, not solid, and he had it completely apart - the seam across the bottom edge of the bar leading to the spindles will split open, allowing the bent wheel thing to curve inward and further split it open, we hammered it closed again, but undoubtedly it will open again as the mower is heavy .. they must be aware of this inherent flaw, and need for reinforcement at that point. The only real way to fix it is to find someone with a welder or some sort, and put a nice chunk of 'stay put' right there. This is most likely caused by a bent tie rod. Here's a video on how to fix it. Watch it all the way through before starting so you don't dump oil and gas all over and immolate yourself. 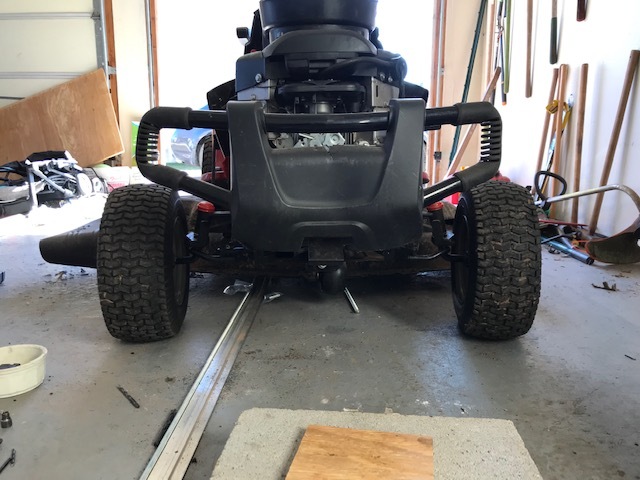 For those who have a toe-out problem with their Sears lawn tractor, I feel your pain. I had the same problem, with the additional problem of the front wheels coming off while cutting . My lawn tractor is a 54 inch cut machine. I has two linkages on each side, a long link from the steering gear to the front axle, and a short linkage running from a plate connected to the front axle to the front wheel. Replacing the linkage might solve the toe-out problem for a while, but it will return as the linkage ages. The solution requires some fabrication, but it isn't too bad. The linkage rods are made of normal steel (not hardened), so they can be modified. My solution was to put rod ends (Amazon, Summit Racing) on each end of the linkages to allow for adjustability, but eliminate most, if not all, of the play in the linkage. Rod ends are usually made with National Fine threads. I found the long linkage has too many minor bends in it to support putting a threads on either end, so I have to bend new linkage rods (5/8 inch rods, but I think one could use 1/2 inch rods). For the short linkage rods, I went to a 3/8 stainless steel threaded rod, but I had to increase the length in order to get the adjustability I needed. Adding a piece to the pivot plate connected to the axle took care of that. I maintained all of the current linkage connection point holes at the factory size (3/8 machine bolt fits just right). Just replacing the short linkage with the rod ends and the threaded rod fixed most of the toe-out problem, and I still have room to make finer adjustments. The pivot shafts for the rod ends are 3/8 inch by 2 machine bolts with the unthreaded part ' hosting' the rod end. One nut threaded all the way down to the unthreaded part, and a second nut to connect the linkage to the existing connection point. I just got the bender to make the longer linkage bars, but I haven't actually make those yet. Some bushings are going to be needed to allow the 5/8 inch rod ends to work with the 3/8 bolt shaft. I still have to extend the steering stops a bit to limit the sharpness of the turn the lawn tractor can make. As far as the wheels falling off, the E-clips that hold the wheel on the axle don't make it. After a few tow-ins, followed by repairs, I drilled a 1/8 inch hole through the axle (they're case hardened, you'll need a carbide bit) and put a spring pin (TSC) through it. I haven't lost a wheel since, and the toe-out fix has taken most of the side play/force out of the wheel. I can give your more details if you're interested. Use: edrews1, Subject: Lawn tractor steering, domain: yahoo.com. BTW, my neighbor has a Sears lawn tractor, but the linkage on his is different. You may need to adjust the fix above to accommodate differences in your steering linkage. Not including the tools, I probably have $25 - $50 in parts and materials. One other hint: don't modify the existing connection points or other hardware in making your fix. If your fix doesn't work you can always go back to the old linkage. Also, those adjustable linkages didn't fit my lawn tractor. They also have the same type of connection hardware as the non-adjustable linkages, so you'll be adjusting the length as the connections loosen up. I also had one of those connection points come apart on me. A further update on my previous post. I was able to bend new longitudinal linkages from 5/8 steel rod. I did it with a bender, but it could be done with a bench vise and a piece of pipe for leverage. I made the bends to match the angles in the old linkages. I left the ends long so I could cut them to length once I had both linkage bars bent. The overall linkage bar length is a bit shorter due to the use of rod ends for the connections. The threading of the 5/8 inch bar takes a large die and some patience, along with some physical work. Take your time, don't push the die. I threaded one to two inches of the 5/8 rod on each end. 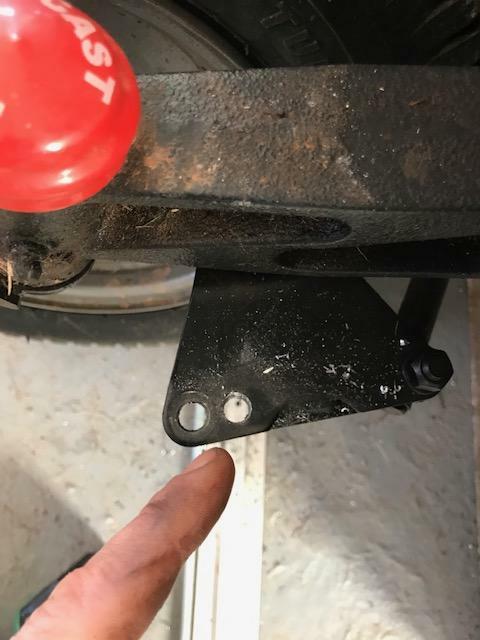 When the rod ends are screwed on, I can match the center of the hole in the rod end with the connection points on the existing linkage bar, and still have some room for adjustment. Since I used 3/8 inch bolts for the pivots, I had to make a bushing to fit inside the rod end and around the 3/8 bolt. One can purchase such a bushing, but they seemed a bit pricey to me. Amazon's bushings were hardened, which I don't think is necessary, but the internal and external sizes were correct. I saw some bushings at TSC, but there was a size issue on at least one of the dimensions. I haven't put the linkages in yet. I'll wait until after I get the lawn cut this week. I'm still working towards adding additional steering limits to prevent the wheels from going close to perpendicular to the direction of travel. That scenario happened once since I put in the short linkage bars, but I didn't see anything bent in the small linkage itself or the connection hardware for the small linkage. edrews1 it would be great if you can take plenty of pictures and create a complete guide about your modification. Use this to create a guide https://www.ifixit.com/Guide/new to show us how it is done. Ed P, do you have any pictures and how is it working? It turns out I actually had a "reverse camber" problem instead of a toe out problem, but this still fixed it while making my toe-in a bit more than i'd like but tolerable. It still drives great and I don't worry about uneven tire wear on grass. I had that with my Craftsman 21hp lawn tractor. I drove one wheel into a hole and bent the tie rod. You can see a video on how to fix this and where to order through repairclinic.com or on youtube. I only replaced the one side, but will do the other to make sure. If you leave this problem too long, your wheel might fall off because there are metal tubes (flange bearings in mine) in each wheel and they will really wear out quickly when the wheels are toes out (facing out a bit). Your wheel/s will then be really loose because of the excess rubbing and actually wear the bearings right down which makes the wheel loose and washers and clamps fall off. That all worked so no need to replace the axle, which seemed not to be bent. I bought a Snapper riding mower yesterday and it's towed out about an inch or more. A friend who is a retired auto master tech told me an EASY WAY to make the tie rods adjustable. My tie rods are 3/8, I went to Auto Zone and bought 2 -- NEEDA #551035 compression unions. He said I can cut the tie rod somewhere and use the union to reconnect the two pieces. But the union will allow me to adjust the tie rods up to maybe 1/2" longer apiece which should be WAY more than I need. For some reason, the part number did not come up on the Auto Zone website, but I found them on one of those spinning hardware displays that also display bolts and door panel clips. To see a pic, go to Yahoo images and type in "551035 compression union". Again, this part number is for a 3/8 tie rod, you need to measure yours and buy accordingly . Hope this helps !!! To put th e best possible face on it, your “friend” the retired Master mechanic evidently forgot what compression unions are and are NOT designed for. Or are safe to use as…. These are BRASS parts, which are are designed to seal BRASS or NYLON TUBING only, and they are only to be used to provide a separable joint and a seal against internal leakage, and certainly NOT to join steel parts together to keep them together against pulling forces. Brass is MUCH weaker than steel-and much less resistant to abrasion/wear. Heck, brass compression unions not even rated to EVER be used on BRAKE lines, which should tell you something about their safety factors and reliability -according to the SAE powers that be. Brass is MUCH weaker than steel to begin with EVEN WHEN USED AT THE AT THE SAME THICKNESS-which, being HOLLOW parts they are not, and are therefore porportionately weaker still. Brass compression unions are not designed with much strength against torsional or tensile or horizontal compression forces (twisting or pulling or compressing parallel to their length) AFTER assembly. In essense you are providing a “designed in”, failure point with such a connection as this part of your steering will undoubtedly fail FIRST, being the weakest point in a system composed using all other steel parts. A Brass compression union also has little ability to take a bend and retain strength, so if you do see any bending in that joint DO NOT straighten it out (which would only make it weaker) replace it-a better way. A FAR better "fix" would be to cut the tie rod, align the cut ends next to each other, mark whatever the new length requires, and then either remove the excess steel and weld the ends together or add what even length of NEW steel is required, then weld the 3 parts together. Or just start with a fresh length of steel rod an add Heim joints if required to achieve the desired length and provide adjustability. “These are BRASS parts, which are are designed to seal BRASS or NYLON TUBING only, and they are only to be used to provide a separable joint and a seal against internal leakage, and certainly NOT to join steel parts together to keep them together against pulling forces. Ummmm……they make STEEL compression unions that would work as he describes above. For a low demand home tractor it would probably work and last for years. I’m going with adjustable drag links though….then I can easily make adjustments to keep the toe in check. Also, although I said the compression unions might work fine, I’d only consider that a stopgap or short term repair until it could be done right. I don’t believe in cutting one long piece that’s been engineered with the bends, etc. in mind into 2 shorter pieces that might eventually twist or turn separately out of line with the way they were supposed to be and just create frequent repositioning issues or other steering issues. Another thing is the majority of time these require replacing the connecting ends (so called “ball joints”) are mostly worn out and need to be changed anyway and they’re all part of the one unit. roy will be eternally grateful.